With little information available, author Rod Clarke's simple hobby of model building turned into a five-year quest for research on two of Ontario's most elusive pioneer railways. 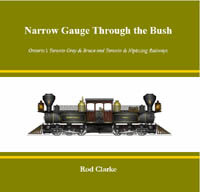 "Narrow Gauge Through The Bush" is the result, an exciting history of the Toronto Grey & Bruce and Toronto & Nipissing railway lines. The Toronto Grey & Bruce (TG&B) is of particular interest. Originally built as a "narrow gauge" railway, its tracks and trains were much smaller than current rail lines. After 1883 it was converted to "standard gauge" and became part of the CPR. With his research, Mr. Clarke put together a wealth of information on the TG&B's planning and construction, with personal insights into the men who built it. He describes the history of communities along the route and how the railway served them. For modelers he details the actual engines, cars and railway buildings. The book's 392 pages are hardbound in large coffeetable format. It contains more than 300 illustrations, and numerous fine-scale drawings that will make it a must reference for railway modelers. The book contains complete rosters of the twenty locomotives of the TG&B and the twelve locomotives of the T&N with the following information, where available: Name, Builder, Serial Number, Date of Delivery, Type, Driver Diameter, Weight, Cylinders, Tubes, Tube Size and Tractive Effort. The following locomotive plans, drawings and pictures are to be found in the Narrow Gauge Through the Bush book. The following colour drawings, pictures and plans of buildings and structures as well as maps of the Toronto, Grey and Bruce (TG&BR) and the Toronto and Nipissing (T&NR) are all to be found in Narrow Gauge Through the Bush.